The Sixteenth Avenue house built in 1954 is arguably one of the finest, most significant architectural designs constructed in Spokane, mid-century. Its post and beam aesthetic reflects not only the Harvard Graduate School of Design (and one of its notable professors, architect Marcel Breuer) where Bruce Walker was educated, it reflects the influence of Southern California designers such as Craig Ellwood, Gregory Ain, Raphael Soriano and Charles Eames who were receiving substantial coverage at the time in progressive national architectural journals. Its architectural importance cannot be over-stated. Bruce Walker never surpassed the quality of its design in his residential work. The Ferris home is a rare tour de force that perfectly celebrates its time and place. 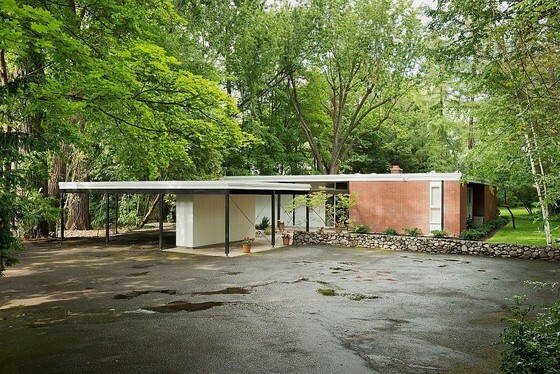 It is a home that beautifully represents the best of the Mid-Century Modern Movement. The home is a wonderful, authentic and courageous integration of disciplined architecture, commissioned art, with the natural and cultivated landscape of the property, and the beautifully appointed and controlled interior design. It is a classic. In 2010, the Pierre was named World Architecture News' House of the Year and in 2011, Art Stable was named Project of the Year by the Residential Architect Design Awards. Architectural Record has chosen two of Kundig’s projects for Record Houses—the Rolling Huts and Delta Shelter. Olson Kundig Architects received the 2009 National AIA Architecture Firm Award (as Olson Sundberg Kundig Allen Architects) and has twice been named one of the Top Ten Most Innovative Companies in Architecture by Fast Company Magazine.